BLDBLOG has an interview with Irish photographer Richard Mosse, who has taken photographs of the Imperial palaces of Iraq (now converted into army bases) for his new project, Breach. "McMansion is a term borrowed by us in Ireland, where I'm from. Ireland was hard-hit by English penal laws, from the 17th century onward. 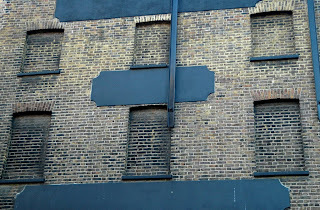 One of those laws was the Window Tax. This cruel levy was imposed as a kind of luxury tax, to take money from anyone who had it; the result was that Irish vernacular architecture became windowless. The Irish made good mileage on the half-door, for instance, a kind of door that can be closed halfway down to keep the cattle out but still let the light in. "Aside from this innovation, and from subtleties in the method of thatching, Irish architecture never fully recovered—to the point that, even today, almost everyone in my country chooses their house from a book called Plan-a-Home, which you can buy for 15 euros. And if you have extra cash to throw in, you can flick to the back of the book and choose one of the more spectacular McMansions. Those are truly Saddam-esque."